When it comes to kids' birthday parties, the sky's the limit! But that doesn't mean you need to buy a special pan for this spaceship cake. Meanwhile, stir boiling water into dry gelatin mix in large bowl at least 2 min. until completely dissolved. Pierce cake with large fork or wooden skewer at 1/2-inch intervals. Carefully pour gelatin over cake in pan. Cover and refrigerate 4 hours or overnight. Dip pan in warm water 10 sec. ; unmold cake onto cutting board. Cut into pieces as shown in diagram and photo. Arrange pieces on large foil-covered board or platter to resemble a spaceship as shown in photo. Spread top and sides of cake with whipped topping. Decorate with remaining ingredients as desired. Store in refrigerator. 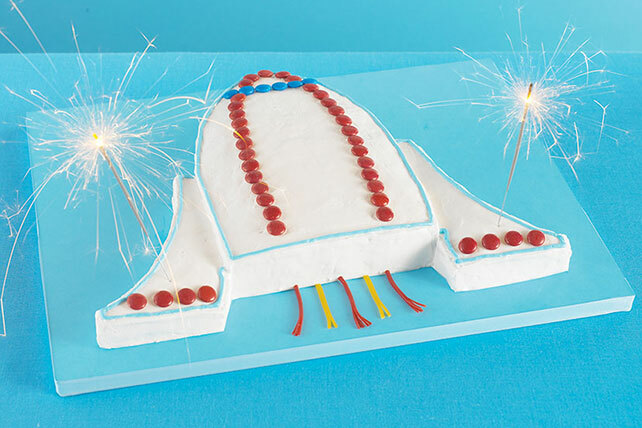 Add sparkler candles to cake and light up just before serving to resemble the blast off! If the cake is very soft and crumbly, apply a "crumb coating" to prevent cake crumbs from mixing with the frosting. Spread a thin layer of frosting over the entire cake, then let stand 5 to 10 min. or until frosting is set. Spread remaining frosting over cake. Make sure cake is completely cooled before frosting. A warm cake can cause the frosting to soften or melt. Prepare as directed, using your favorite flavor of JELL-O Gelatin.